People’s Bank signed a landmark USD 200 million, eight year, bilateral funding facility with China Development Bank. This is one of the largest ever and the longest tenor funding facilities secured by any commercial bank in Sri Lanka up to now. The signing ceremony was held at China Development Bank’s Guangxi Branch in Nanning, People’s Republic of China on March 27, 2019. 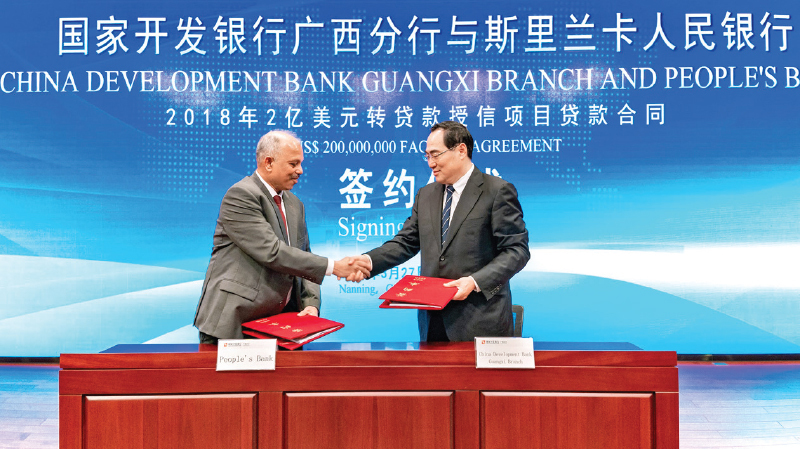 Mr. N. Vasantha Kumar (Chief Executive Officer/General Manager) and Mei Shiwen (General Manager of Guangxi Branch) signed the facility agreement representing People’s Bank and China Development Bank respectively. Thereafter several rounds of discussions were held between senior officials of People’s Bank and China Development Bank with regard to future corporation between the two institutions. China Development Bank selected People’s Bank to sign an historic Memorandum of Understanding in May 2018 covering areas such as financing, customer referrals, introducing investment opportunities in Sri Lanka and Training and Experience exchange etc. The aforesaid facility was signed as a result of this Memorandum of Understanding. Since its inception 57 years ago, People’s Bank has opened its doors to customers across the country, and has continuously leveraged its resources to uplift many lives through financial services. The China Development Bank was founded in 1994 to provide development-oriented financing for high-priority government projects.